If the Nevada Energy Choice Initiative passes in the November election, it could cost Boulder City more than $1 million in lost savings each year as well as generating higher electric rates. 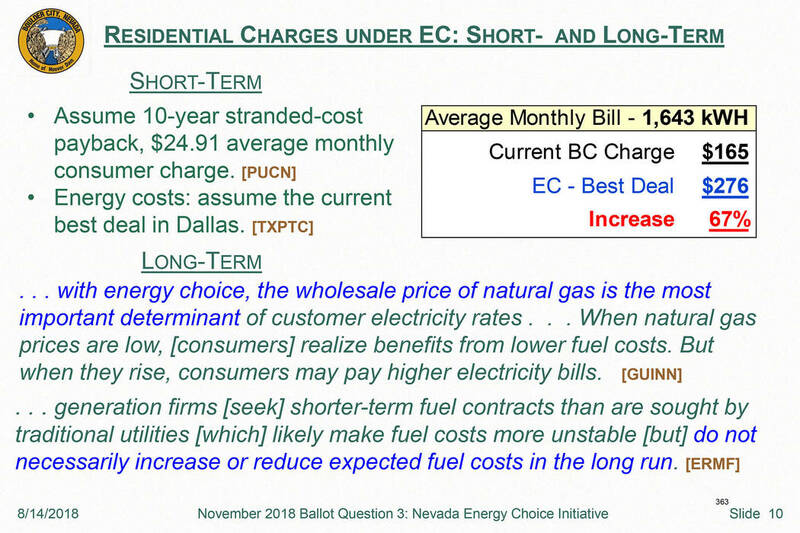 Boulder City Boulder City's Electric Utility Administrator Rory Dwyer's research on the Nevada Energy Choice Initiative found that Texas' rate energy choice legislation brought higher rates. Boulder City If voters pass the Nevada Energy Choice Initiative in November, Boulder City could see higher rates. When compared to similar legislation in Texas, they could increase 67 percent. At Tuesday’s City Council meeting, Boulder City’s Electric Utility Administrator Rory Dwyer told council that the city could lose more than $1.6 million each year in potential energy contracts if the initiative passes. The energy choice initiative, or Question 3 on the ballot, was designed to prohibit electricity monopolies. 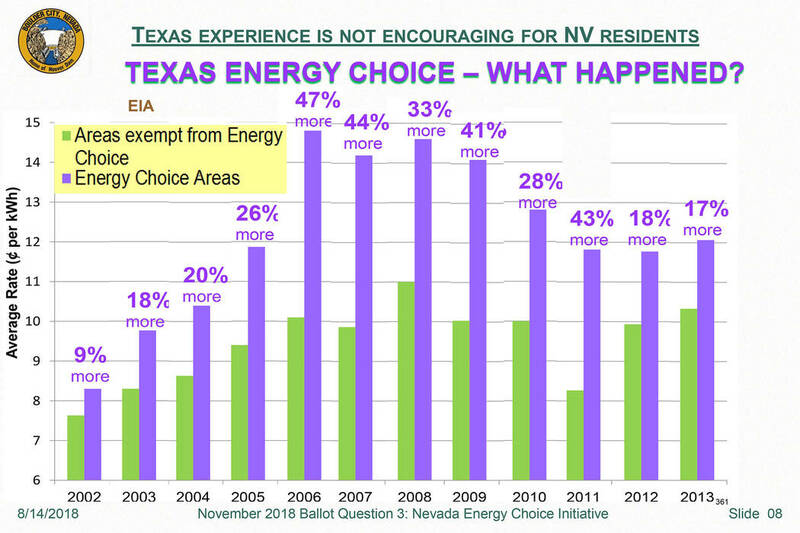 If it passes, NV Energy would lose its monopoly in the state and the Nevada Constitution would be amended to give energy customers the right to choose their energy provider and generate their own resale. The Nevada legislature would provide those laws by July 1, 2023. In his research, Dwyer found some potential impacts for Boulder City. One of the largest was that potential loss of contracts. He said the city could lose them because its right to receive hydro energy from the dam would be decided by future legislatures and courts. If it can’t receive that energy, it would lose $1.63 million in savings annually, based on 2019 fiscal year rates. Additionally, whether it would be compensated for that loss would be determined by future legislators and courts. Dwyer also said a common expectation is that the ECI would decrease residential electric bills. But, according to the Public Utilities Commission of Nevada’s final draft report on the initiative, monthly electric bills are likely to increase for the first 10 years. Additionally, Dwyer compared utility charges with fees in Texas, which implemented a similar energy initiative. Taking into account what Boulder City charges for electricity and the best deal in Texas, the average monthly bill for residents would increase 67 percent, he said. The rates could also change due to the wholesale price of natural gas. Dwyer also said that final draft report from the Public Utilities Commission of Nevada showed concerns that the ECI will have a “considerable negative financial impact” to rural communities. McManus said he wanted to hear the facts about the ECI before a pro and con presentation scheduled for the Aug. 28 council meeting. “My takeaway is that a vote yes on Question 3 is a vote to buy a bag of maybes,” said Councilman Warren Harhay. Additionally, he and Councilwoman Peggy Leavitt said a yes vote would task the legislature with writing energy policy. Mayor Rod Woodbury said he had propaganda for both sides of the question, but he had not heard much about how it could help or hurt Boulder City. “It was great to hear that,” he said. Dwyer’s presentation was intended as an educational resource for voters and did not require any action by council. “To me it seems as though there is very little potential for us to benefit greatly from it and a lot of great potential for us to be quite hurt by it,” said James Adams about the ECI. Resident Matt Di Teresa said he enjoyed the presentation but he thought it was negative and one-sided. “A quick Google search of deregulation will show that there are lots of positives for deregulation in states all across the country, so before anybody votes, get on the internet and look and see how deregulation has worked in other parts of the country,” he said. Dwyer’s presentation is available on the city’s website at http://bcnv.org/CivicAlerts.aspx?AID=58. ■ Approved PAR Electrical Contractors Inc. bid of $3,783,768 for the 69kV transmission loop project. This bid was for overhead power lines rather than underground ones. PAR’s bid for the underground line was for $5,215,383. Council unanimously approved the bid but also requested that the cost for a partial underground option be presented at the Aug. 28 council meeting. ■ Approved a contract with Epic Aviation LLC to provide fuel service at the Boulder City Municipal Airport. ■ Approved a 3 percent salary increase for part-time employees. ■ Approved a staff directive to seek appraisals for two different properties, one was for a lot line adjustment at 395 Avenue I for approximately 7,000 square feet, and the other was a lot line adjustment at 115 Casa Montana Court for approximately 7,800 square feet. ■ Approved appointing William Wilson the Parks and Recreation Commission. ■ Approved re-appointing Alan Goya and appointed Charles Hauntz to the Historic Preservation Committee.